Challenge your family, friends and neighbors to get out and run or walk the annual Georgetown TX Turkey Trot, and start your Thanksgiving off right! There will be three fun courses to choose from (making it perfect for every fitness level) including the Turkey Trot 5-mile run or 1-mile walk and The Caring Place Kids K. These events are great for strollers, and dogs on leashes are welcome, as well. No bikes are allowed. Come out and run or walk the awesome Georgetown trails and roads starting and finishing at 701 South Main Street in the beautiful and historic downtown Georgetown Square. 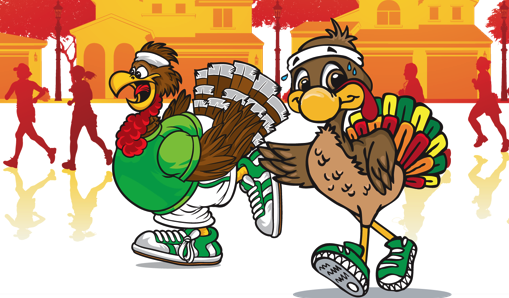 The Turkey Trot Georgetown runs start at 8 a.m. on November 22nd and the The Caring Place Kids K (for the youngest runners) will start at 7:45 a.m. Entry for the Turkey Trot is $35 until November 21st and $40 on race day. The Kid’s K entry is only $5, and parents can run with their kids for free! Georgetown Running Club members receive $5 off. This is an untimed fun run with the goal of donating over $1,000 to the race charities; however, there will be a timing clock sponsored by Event Data Solutions at the finish line for you to see your time as you finish. This year’s Turkey Trot Georgetown, TX event is hosted by the Georgetown Running Club and Sertoma. The Georgetown Running Club is a non-profit organization whose mission is to promote and encourage running, walking and fitness in the community and to provide competitive and non-competitive activities for its members and the general public. Established in 2008, the GRC has grown to over 150 members and has become a “healthy” part of the Georgetown community. The Georgetown Sertoma club (SERTOMA is an acronym for SERvice TO Mankind) was chartered in 1979 with speech and hearing as the group’s main focuses. They have been very active in addressing the needs of the Williamson County community, one of the fastest growing counties in the USA. Their mission is to improve the quality of life for those at risk of or impacted by hearing loss through education and support. With 7 Hearing Aid Collection Centers located throughout Central Texas, the Sertoma Hearing Aid Recycle Program has provided over 300 hearing aids each year to the University of Texas Speech & Hearing Center located in Austin, Texas. The Caring Place is the host of the annual Kids K event. Since 1985, The Caring Place has provided basic human services for families in financial crisis in Georgetown and northern Williamson County. The organization provides a variety of services to the community including financial assistance, food/clothing/household items/furniture, emergency/temporary assistance, alternative loan programs, healthy option programs for the elderly (HOPE), and more. And the sponsors of this year’s Georgetown TX Turkey Trot are AdvoCare and Event Data Solutions. All proceeds from the event will be shared between Williamson County Meals on Wheels and Friends of Georgetown Parks and Recreation (Park Pals). Event sponsors will also be collecting nonperishable food for The Caring Place. Nestled in the peaceful Hill Country of Northwest Georgetown, The Gardens at Verde Vista is a more intimate community limited to only 149 low maintenance courtyard garden homes and villas and with private amenities for the exclusive enjoyment of the residents. Contact our friendly community sales counselor, Cristy, to set up a private tour and to learn more about starting a new “Life Without Limits” free from mowing your yard or cleaning a bunch of extra rooms and space you hardly use anymore. Plus, get your choice of a free outdoor kitchen or wood floors (in main living areas) if you contract to build a new home in November.